Inexpensive meals don’t have to be cheap, skimpy, or sup par. You can get excellent meals for less than $5; some for as little as $3.99! Want to see some examples? Check out 3 Buck Bites. Hey It’s Free! is a good place to start. Here you can get free restaurant coupons and certificates for joining various restaurant clubs. If you want to eat out with the whole family, many restaurants allow kids to eat for free (with the purchase of an adult meal). Some of them will allow 2 kids per 1 adult meal. When my kids were small, my husband and I would split an adult meal and the kids would still eat for free. This article is a good example, but nights and offers change from city and city and state to state. Of course, you can almost always get a free meal (or dessert) on your birthday just for asking. TGI Fridays experimented with a $5 menu and then cut the cost of several of their popular dishes (by more than half!). They still serve the full-size entries as well. Subway has the $5 footlong sandwich (that easily serves 2 people). For what it’s worth, we tried the $4 footlong from Quiznos, and we were sorely disappointed. While the sandwich was a foot long, the bread was the width of a hot dog bun. They now have their own $5 large sub special. Steak ‘n Shake has the 4 under $4 menu that is quite tasty. Boston Market has a good selection of $5 favorites. Shoney’s has a $5 breakfast bar. A site called $5 Dining is a search engine for $5.00 meals. Currently, they only list restaurants in Alabama, Georgia, and Texas, but they’re expanding slowly. 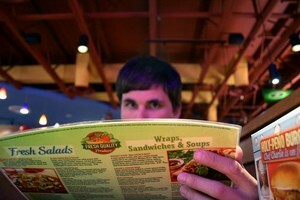 Become a mystery shopper to trade a bit of your time for a good meal. Skip the expensive soft drinks and order water with your meal instead. Order appetizers only. Most of the times when I eat out, I am full from the bread, salad, and appetizer — so I end up taking the entree home with me. It makes sense just to skip the entree instead. Order off the lunch menu, instead of the dinner menu. Lunch is served as late as 4PM in some restaurants. Most of the time, you get the exact same items (just slightly smaller portions) and the price is several dollars cheaper at lunch time, as opposed to dinner time. Skip the wine and dessert. Save those for special occasions.